OldMedic's 2012 TFC Adventure: Ok, who is this harlot named Vanessa? Well, I have had a few questions about this "Vanessa". This type of bike is called an "Adventure Touring" bike. 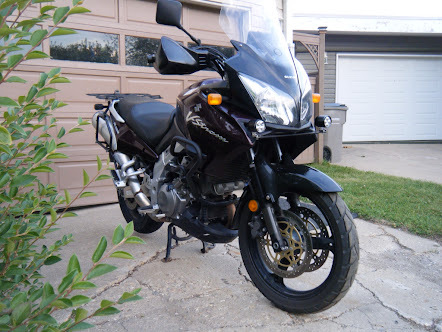 These are the types of bikes that people tour the world on, they are comfortable to ride, they can be ridden off highway and with this particular model are relatively inexpensive. There is luggage to be added. Where I will store my clothes, food, tent, etc..... I will post pictures of that. 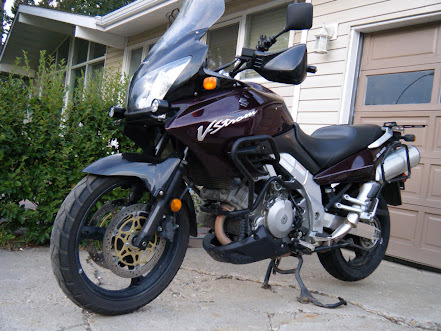 Marilyn and I each have one of these bikes, we used them to travel to Alaska/Yukon last year. I have done a number of modifications and enhancements to Vanessa, not those kind of enhancements :), but generally to increase reliability and safety. These are not high performance bikes, they just get the job done. Ok, I have to start packing.... Bye for now.